I have the pleasure of talking with Jay Treat this time out. Jay has a new game called Cunning Folk. 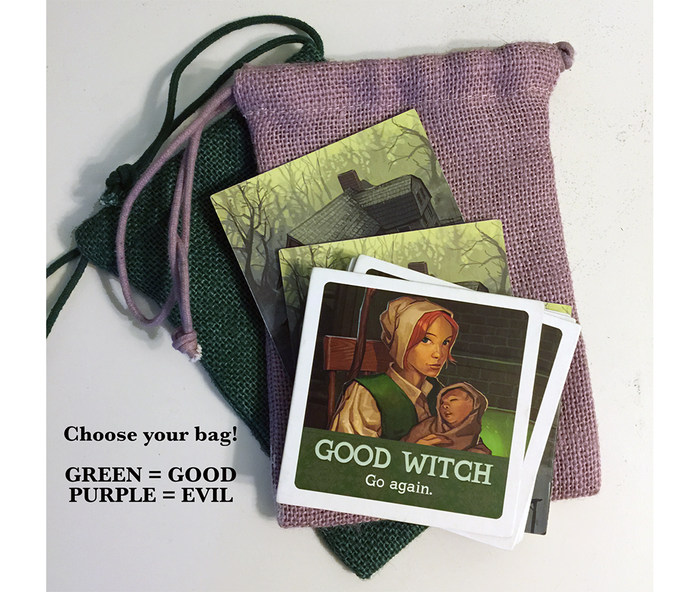 The game has a couple of days left on Kickstarter and it’s way over funded. It’s hit two of its stretch goals and is inexpensive. Tom: Well Jay, It has been a while. Why don’t you remind us about Jay Treat. Jay: Nice to be back, Tom. I love board, card, and party games, as well as video games, RPGs, and freeform LARPs. I believe games are a force for good in the world, bringing strangers together as friends, and helping us continue to learn and grow. Tom: Freeform LARP. You’re probably familiar with Jason Morningstar who is a big LARP evangelist.He’s an acquaintance of mine and such an excellent rpg designer and guy. Have you played Fiasco? Jay: I met Jason at Metatopia where I played his first test of a Fiasco LARP. No one doubts Jason’s talent, and Fiasco has done wonders for the Indie RPG community. 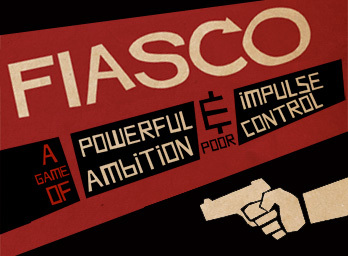 Tom: I had the pleasure to be one of the Fiasco playtesters. I can’t say enough good things about that game. You are right that it has done so very much for the Indie RPG community. That reminds me that I need to have him on the show. What’s your gameography (ludography?)? Tom: I’ve not played Cahoots! but it sounds fun. Any plans on making it a physical game? Jay: Absolutely. We’ve gotten a ton of feedback from players hoping for a physical copy and we’re evaluating potential publishers. That was always my goal. Tom: We are here to talk about Cunning Folk. Give us the elevator pitch for the game. Jay: Cunning Folk is a 13-card micro-game of bluffing and deduction. Players search a small village looking for good and evil witches, lying about what they see where, and trying to oust one coven or other first. Tom: What’s the story behind Cunning Folk? Where did the idea come from? Jay: Jason asked me if I had any ideas for his line of wallet games and I said I don’t do micro-games but I’ll think about it. The next morning a compelling image lingered from my last dream and I wondered what kind of small card game I could make from that inspiration. By lunch I’d mocked the cards up and it played surprisingly well. I played again that evening and let Jason know I’d come up with something he’d be wanting. Tom: What was the most challenging part of designing it? Jay: I’ve never had so much luck going from an initial idea to a polished experience so quickly. But Jason and I spent a lot of time finding exactly the right title, names for the cards and text for the abilities; to be crystal clear, very short, flavorful, and inoffensive. Tom: It’s a social microgame. It comes in a wallet. It costs $7. That’s very cool. What sets it apart? 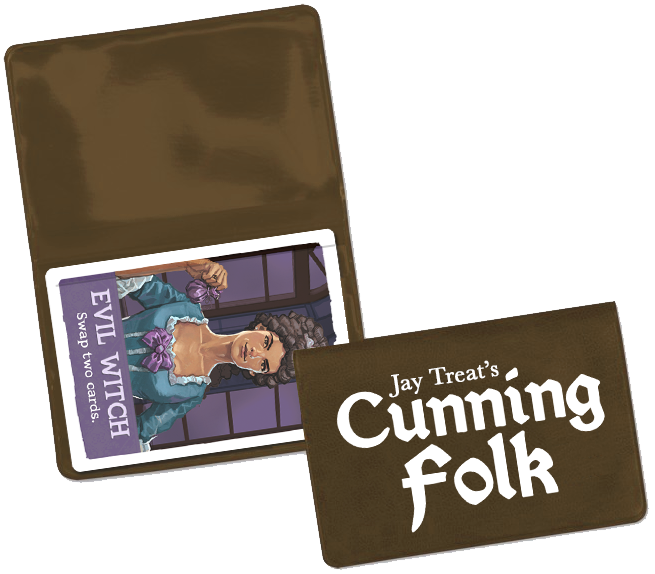 Jay: Cunning Folk delivers a satisfying challenge for players who love figuring things out, as well as players who love lying and calling their friends out. I continue to be stunned how much play is packed in such a small package. Tom: Now for some general game design questions. What is the least fun part of designing a game? Jay: The second 90%. Choosing your goal, mapping out your vision, building the prototype, and finding the fun—that’s all play. Stripping the idea down, shaving off the corners, balancing it, and finding its home—that’s work. It’s fulfilling work, but challenging. Jay: In general? “This is two games.” For Cunning Folk? Giving players one free mistake before they’re eliminated. Knowing you’ve got room to breathe emboldens players, and having some players in greater peril than others creates a fun dynamic. Tom: A free mistake? That is a really cool idea. What makes designing games so fun? Jay: Game design exercises so many different disciplines; I use Philosophy, Math, Writing, Communication, and Engineering all the time. Building those disparate skills of one another is a unique thrill. Others bring still more disciplines to bear, bringing us such a wonderful diversity of games. Oh, and the end result? People laughing and smiling together. Jay: Pare down, usually. I tend to be pretty pie-in-the-sky and usually need to bring myself to a rational level and then start peeling off games until there one best game is left. Tom: Do you have a really big game inside trying to get out? Jay: I’ve got this crazy idea for a crowd-sourced digital card game. In my head, it’s the best thing ever. In reality, it’s the sort of thing that would require a massive investment to get rolling. I think I’ll try a medium game or two first. Tom: Mechanics or theme first? Which is most important? Jay: Both together whenever possible. Designs can start from so many different places: mechanics, theme, audience, format, components, experience. But none of these things are optional and the earlier you start thinking about all of them, and how your game will blend them into a cohesive whole, the better each individual piece will be, to say nothing of the whole. Tom: Tell us about a ‘Eureka!’ moment. Was there a moment when you went ‘Yeah, this is a game.’? Jay: I was probably in the shower sorting the random ideas from the morning into a game-shaped box when I realized I’d most likely stumbled onto something simple enough to get players past the cards and playing each other. Jay: I’m lucky to count a lot of talented up-and-coming designers among my friends. Among established designers, Antoine Bauza gets mad props for the brilliance that is Hanabi, Rob Daviau for a long string of badly-balanced and wildly fun games (Betrayal at the House on Haunted Hill, Star Wars: Epic Duels & Heroscape), and Richard Garfield for having the strongest academic understanding of games, while still being able to make an approachable just-for-fun game like King of Tokyo. Tom: In that interview with Scott Almes he mentions, regarding Kickstarter that “a lot of publishers are not looking for filler-style games. They are looking for something more flashy, I guess. I have a hard time imagining a company putting up Coloretto on kickstarter, because it’s not that flashy.” I think he may be onto something here. I’m taking publishers in his quote to mean the larger companies – Asmodee, FFG, Rio, Queen, etc.. I get the feeling that they are more interested in larger games, the Queen Big Boxes for example. It’s the smaller companies (Dice Hate Me, Green Couch, Gamelyn, etc.) that are doing the ‘filler’ games. It seems kind of appropriate in a sense as a smaller company puts a lot more on the line if they go after a large game. TMG and Stronghold would be exceptions I think. What do you think? Jay: Large publishers make small games, but they don’t rely on KickStarter to do it. They’ve got the capital to print and distribute the game regardless, as well as the industry knowledge and customer base to market them with confidence. Smaller companies often need that support up front to get the ball rolling, even for small games. Publishers of all sizes enjoy KickStarter to gauge interest for large games, eliminating the risk of investing in an expensive product that might not sell at the price point it requires. Slam-dunks like FFG’s Star Wars licensed gamed being an obvious exception. Tom: What do you think is driving up the game prices, other than normal production costs? Jay: I don’t think we’re paying more for what we’re getting, but I do think we’ve seen a trend over the last decade where publishers are going all-out on game’s production values, and they’ve got to charge more for it. Perhaps where the gamer audience had been quite frugal in the 80s, they’re now more interested in quality because many of them have grown into well-paying positions, or because console video games have raised the bar for what a game is worth. Tom: That’s a very interesting take that I’ve not heard yet. Thanks for pointing that out. What are some things that you have learned about playtesting? Forget your ego. If you can’t separate your value as a game designer from your execution on one particular project at one particular snapshot in time, you’ve got no chance of hearing how to improve your game. Ask the right questions. If you ask for “any feedback” you will get random suggestions rather than pointed analysis. Ask instead about specific areas of concern. If you pose a question so that your players feel inadequate, they won’t answer. Show where you think the game might be failing, and let them tell you how. Find out what the issue is your playtester is trying to address. Their solution is rarely ideal, but their concern is always relevant. Ask leading questions, but don’t argue. Always thank your playtesters. Jay: I’ve learned all the easy stuff and now I’m onto some really hard lessons. Right now, I’m focusing on how to evoke joy in the player experience, and prioritizing that over the goals that initiated the project. You need a destination to get started, but most journeys will take you somewhere better if you’re willing. Tom: “how to evoke joy in the player experience, and prioritizing that over the goals that initiated the project” That is a really great way of verbalizing what we all are after as designers. Neat. It gives me something to think about and strive for. Thanks. You are just full of good points. After Cunning Folk, Merchants of Araby is up from Game Designers Clubhouse. Talk about it. Jay: I sent the game to David for blind playtesting and was ecstatic to hear that he loved the game and wanted to buy it. It has enjoyed a theme change and we’ve been working together to find our shared vision for the project. It’s a unique fusion of negotiation and engine-building. I’m excited to see the finished product, something greater than either of us could have made on our own. Tom: I have an interview with David McKenzie in the works so we will be talking more about it. Jay: David’s a great guy with some impressive game experience. I’m lucky to work with him. Tom: Button Shy is Jason Tagmire’s company and they are publishing Cunning Folk. Why did you go with him? Jay: Jason is a lovely person and a personal friend. Even if he weren’t, I love his wallet line business model, and his dedication to quickly deliver fun, portable games. His track record is enviable, and his enthusiasm contagious. Tom: What are some of your favorite games? Tom: If you have a favorite cartoon what is it? Jay: Cartoon? 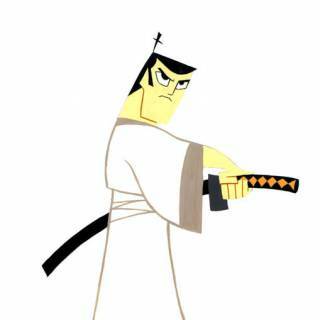 Does Samurai Jack count? Tom: Oh, absolutely. Great pick. Any final thoughts? Jay: It was a pleasure chatting with you, as always, Tom. Thanks for your continued efforts highlighting up and coming games and designers. Jay, it has been my pleasure to talk with you this time. I’m very glad Cunning Folk will be published and has so many backers. It looks like a really fun game. Readers, you can support Cunning Folk right here. You only have a couple of days left to get it though. I’d like to know what you thought of this interview. Please leave a comment by clicking the word balloon at the top. Or you can tweet me at @goforthandgame or @tomgurg. Thanks for stopping by. See you next time when I’ll be talking to Matt Wolfe about Wombat Rescue.